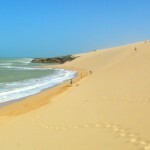 In the middle of June, I arrived in beautiful Cabo de la Vela, a tiny town in La Guajira, the northernmost region of Colombia: home to much of the country’s indigenous population, and seemingly, most of the country’s wind. 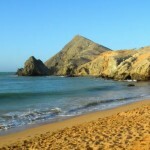 ‘Cabo de la Vela’ translates to ‘Cape of the Sail’, and for good reason. 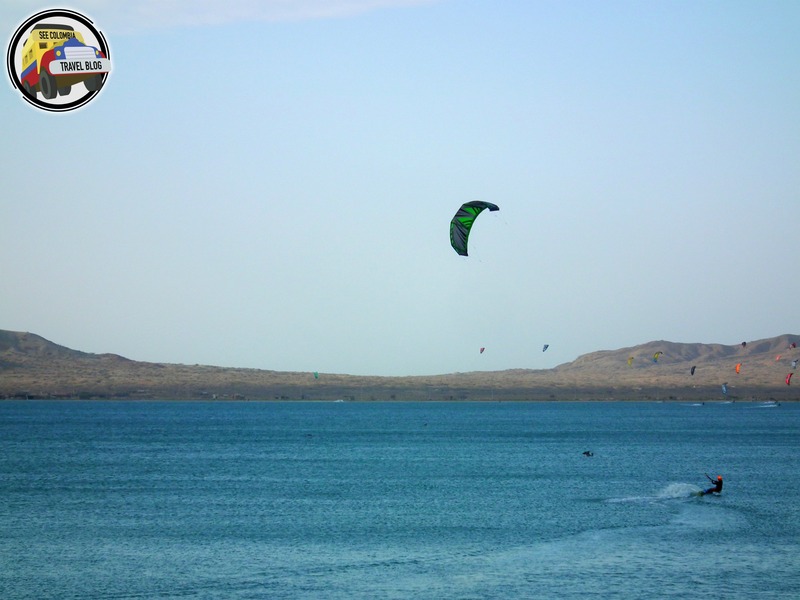 For 355 days a year, it has perfect conditions for both kitesurfing and windsurfing. 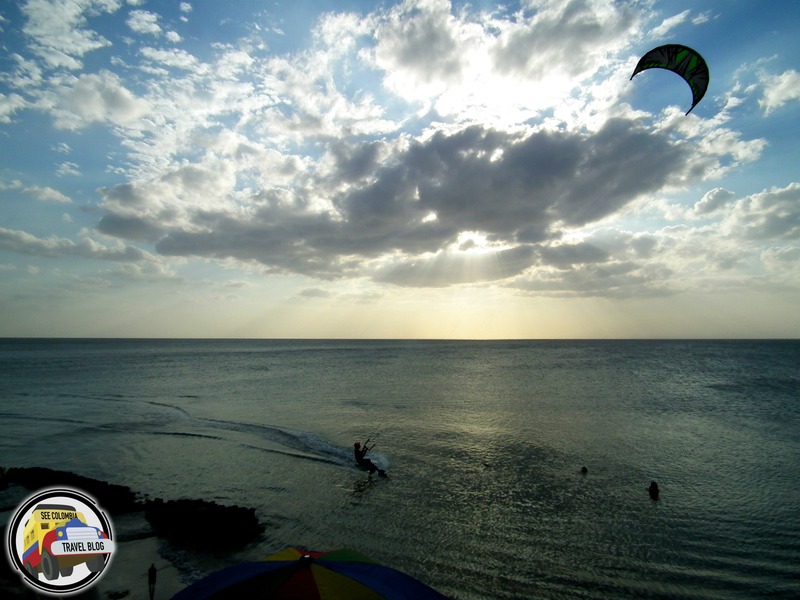 In fact, it is one of the best places for kitesurfing in Colombia. As I wandered along the shoreline, I was captivated by the dozens of kite surfers out on the water. They were catapulting into the air, pulling fearless tricks and shrieking with joy. I had only intended in stopping by Cabo for a night but it suddenly dawned on me, I needed to stay and learn to do this. Such has been the attraction for more and more tourists flocking to this bizarre place where the desert pours into the Caribbean Sea. The town now revolves around the sport. One restaurant had a sign professing ‘Some people have religion. We have kitesurfing’. The glassy, turquoise waters in the bay remain calm, even as the wind picks up in the late afternoon, so it’s ideal for learning to kitesurf. 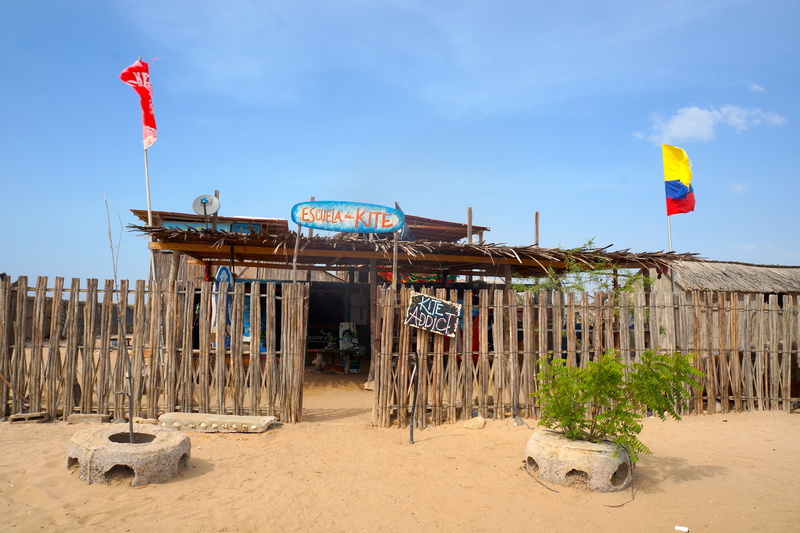 Spread amongst the local Wayuu people’s settlements are a number of kitesurfing and windsurfing schools. 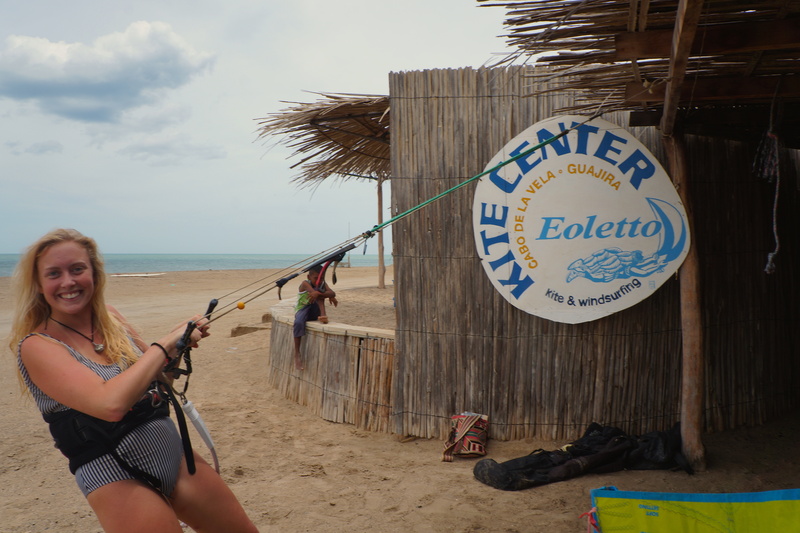 I opted to stay with the sweetest couple, Paula San Martin and Etto Martin, at their home and kite school, Kite Center Eoletto, named after Eol, the God of wind. Theirs is the longest running kite and windsurfing school in Colombia, and has operated in its current location for four years. According to Etto, the biggest differences with his school are the level of professionalism, multilingualism (lessons are available in Spanish, English and German), as well as their attention to safety. Unlike several schools in town, he never works with the local children, recognizing the urgent need for them to attend school. He also insists on students’ use of life jackets and has a rescue boat on-hand, in the event they get dragged too far downwind and out to sea. At Eoletto they use schooling equipment for lessons, rather than that aimed at advanced riders. 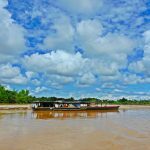 I love the principles that Etto and Paula adhere to – they have immense respect for the Wayuu right to the land, so work in conjunction with a local fisherman and longtime friend of theirs, Jorge-Luis. 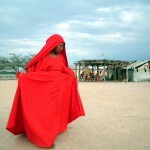 A Wayuu native, Jorge-Luis has lived in Cabo de la Vela his entire life. His family holds the reservation’s record for the most children – he has “forty-something” brothers and sisters. Every day, once they’ve returned from fishing, he and several of these brothers, touchingly all named Jorge-something, spend their afternoons teaching kitesurfing alongside Etto. Prices are affordable, especially given the high-quality of the lessons. To start with, it’s all about gaining control of the kite, which requires a lot of patience and focus. Then, after eight or ten hours, a typical student should be able to start and surf on the board. During the several kitesurfing lessons I took in Cabo, I was first taught the fundamentals of setting up the kite and all its lines, flying it off the ground, holding the bar and NOT PULLING on the bar (something I had to be retold every ten minutes). Then I sat in the shallow water and learnt to move the kite through its ‘wind window’ – the concept of the kite flying at different positions in the sky. It is not until you prove you can efficiently hold the kite and change it on command without it hitting the water, that you are able to move onto the next stage – body dragging. Here you learn to draw the kite in the power zone, and have it pull you through the water. I was stuck on these early stages for an absurd amount of time, so it was a huge relief on my last afternoon in Cabo when I finally got to use the board and feel like I was properly kitesurfing, if only for a few meters at a time. I owe that incredible adrenaline-rush to Etto, who was an excellent teacher. He was kind, patient and never lost his temper, despite me making the same mistake at least 25 times in a row. All the persistence was so worth it: it was the greatest possible sensation. Following that final lesson, Etto and I headed back to the homestead and sat down for a beer and debriefing. Another talent of Etto’s is his bartending. He makes a killer kamikaze cocktail in his tiki-style, Wi-Fi-equipped bar, Fito’s. This bar is the best spot in all of Cabo for relaxing, beer in hand, and watching the sunset. 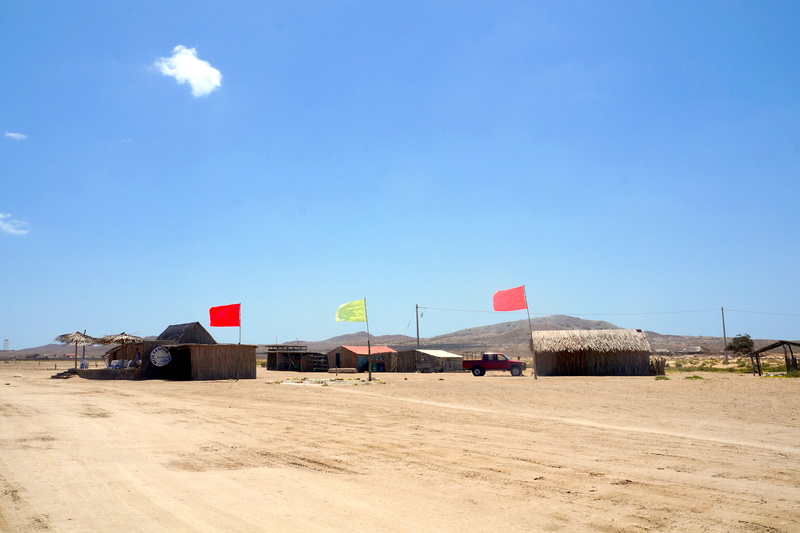 I loved the location of Eoletto, further east along the bay, so away from the madness of the town center and early-morning megaphone announcements that cars are leaving to Punta Gallinas. I often spotted washed-up starfish and huge conch shells on my daily stroll to town. 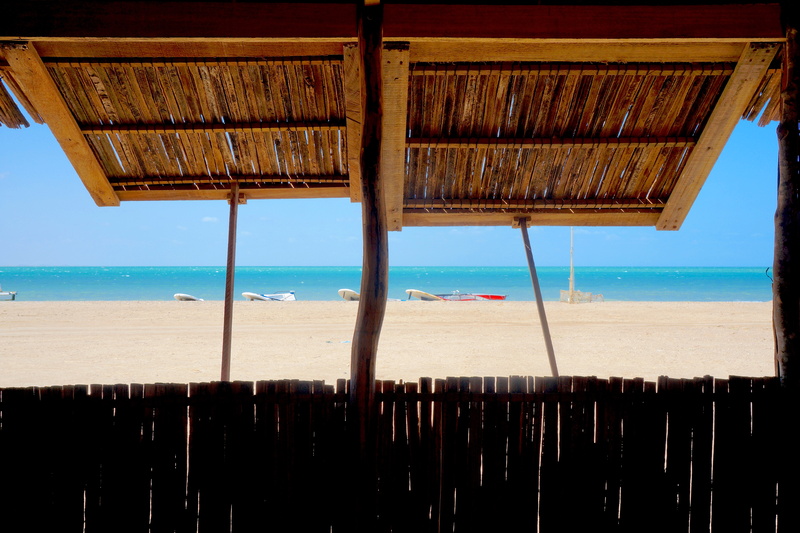 I slept in a wooden cabana in a huge, comfortable chinchorro for $25,000 cop per night. The view upon opening the windows in the morning was a constant delight. For $15,000 cop, the cheaper options are to sleep in a standard hammock, or else in your own tent on their property. Paula and Etto’s dream is to build enough wooden cabanas to host 40 or 50 guests at a time. They’re investing in more solar panels and expanding their kitchen to accommodate more people. If you’re feeling at all homesick, this is the place to stay for some pseudo-parenting. Paula and Etto were both such warm and gracious hosts. I was lucky enough to spend my birthday in Cabo, only to be greeted in the morning with candle-lit pancakes and them singing Happy Birthday to me. Eoletto also seemed the perfect spot for more mature travelers, those really committed to kite or windsurfing, as well as couples, who can have their own romantic cabana and enjoy the serenity. For backpackers, I’d say Kite Addict, the double-storey, open-air kite school, is the most social place to stay in town, whether you’re planning on kite surfing or not. It is run by Martin Vega, who was actually taught by Etto five years ago. Kite Addict attracts a younger crowd, so I spent a lot of evenings there, hanging out with the instructors, playing chess, drinking at their Kite Bar and listening to a lot of Bob Marley. It is a fantastic space, right in the heart of all the restaurants and general store, and has sand floors, colourful handmade furniture and chilled-out vibes. The second storey boasts a fantastic view of the beach and town, and there are plenty of comfy chinchorros strung up for sleeping. Those taking a full course get free accommodation, while it’s $10,000 cop per night for those taking shorter courses, or $20,000 cop for non-surfers. 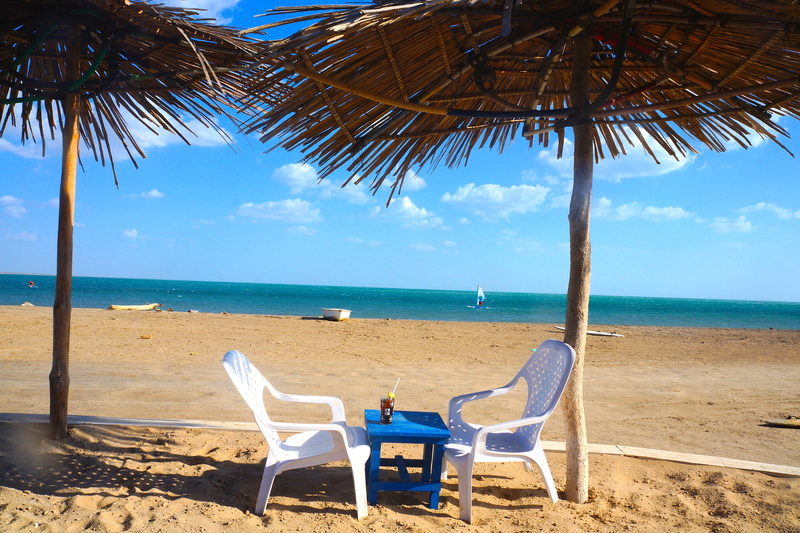 Whether you opt to learn to kite or simply stay and relax in the desert heat, several days spent in Cabo de la Vela, will undoubtedly be some of the strangest, but most rewarding of your entire time in Colombia. It’s easily been the highlight of my four months here, and I long for the day I can return. 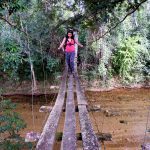 Make time to do this in Colombia!